The Brights write to Miss Berry to explain why they have been unable to send their small contributions and send their wishes for success. 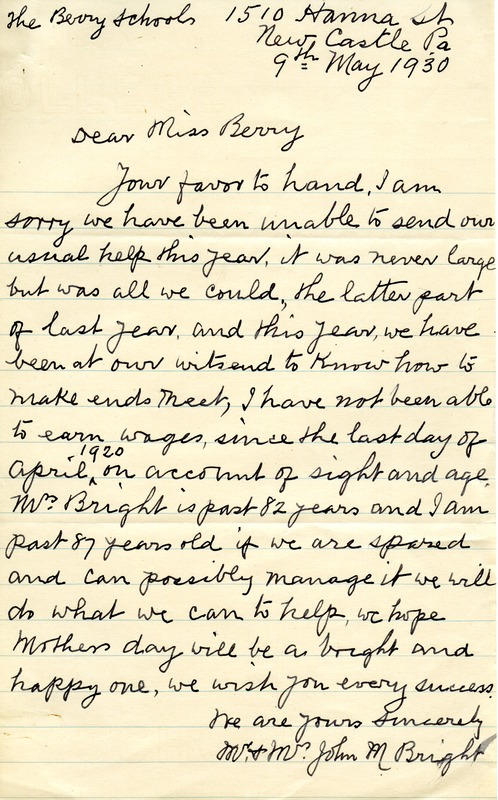 Mr. John M. Bright, “Letter to Martha Berry from Mr. and Mrs. John M. Bright.” Martha Berry Digital Archive. Eds. Schlitz, Stephanie A., Chelsea Risley, et al. Mount Berry: Berry College, 2013. accessed April 22, 2019, https://mbda.berry.edu/items/show/11875.